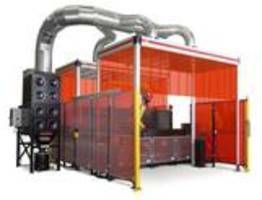 The Statiflex Complete Weld Fume Control Systems are available in 4, 8 or 12 bank configuration and are suitable for applications such as automation, fabrication, indoor welding facilities and welding education/training. The Smart Connect control panel is used for filter cleaning. The systems feature a 4 HP fan motor with variable speed starter. The units are capable of monitoring differential pressure across the filters and automatically start the cleaning process when they detect differential pressure above the pre-set value. 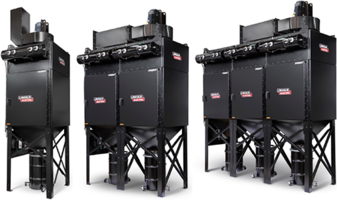 Cleveland – Lincoln Electric® introduces the Statiflex Complete weld fume control system series, available in a 4, 8 or 12 bank configuration. Ideal for a range of applications including automation, fabrication, indoor welding facilities and welding education/training, the Statiflex Complete is a multi-market extraction unit. The Statiflex Complete is a self-cleaning, small footprint unit, where the filters, fan and controls are all contained in one package. All Statiflex Complete systems are equipped with the Lincoln Smart Connect™ control panel for filter cleaning, optional Spark Guardian for applications with an increased fire risk and optional Transformer Kit available for 575V applications. All systems also have Merv 11 and 16 filter cartridge options. The Statiflex Complete 4 has a 4 HP fan motor with variable speed starter, while the Statiflex Complete 8 & 12 have a 10 HP motor with variable speed starter. 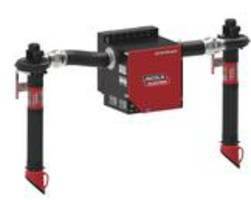 Automatic Cleaning - The system is capable of monitoring differential pressure across the filters. If detected above a pre-set value, the system knows that filters are clogged and automatically starts the cleaning process. The particulate is blown off of the filters by controlled blasts of compressed air, causing the dust to fall into the dust bin where the contaminate can be extracted. Quick and Simple Installation - The system comes shipped over pallets, and has a simple 5-step installation process. Quiet Operation - The fan compartment is lined with premium quality sound absorbing material to reduce operating noise. The silencer on the exhaust side of the fan reduces airflow noise, resulting in a quietly operating fume extraction system. Intelligent Fan Control Technology - The variable frequency drive fine-tunes the extraction airflow to the requirements of the application. The variable frequency drive also regulates the fan speed based on filter loading to maintain consistent airflow. 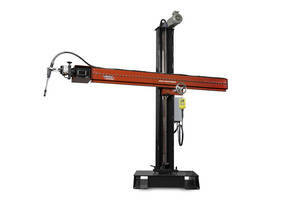 This adjustment capability maximizes fume extraction, conserves energy and extends the equipment life, which ultimately results in capital expenditure savings. Small Footprint – The unit can be installed next to a robotic or plasma cutting system without taking up a large amount of floor space. 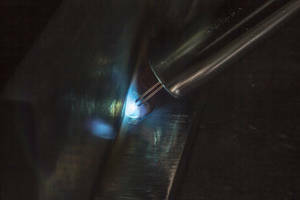 A multitude of welding processes are available, including stick, MIG, TIG, flux-cored, plasma-cutting, arc gouging and grinding. For more information visit www.lincolnelectric.com. Lincoln Electric is the world leader in the design, development and manufacture of arc welding products, robotic arc welding systems, plasma and oxy-fuel cutting equipment and has a leading global position in the brazing and soldering alloys market. Headquartered in Cleveland, Ohio, Lincoln Electric has 56 manufacturing locations, including operations and joint ventures in 20 countries and a worldwide network of distributors and sales offices covering more than 160 countries. 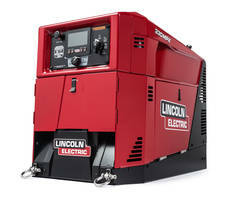 For more information about Lincoln Electric and its products and services, visit the Company’s website at http://www.lincolnelectric.com.